I have tried to specialize in smaller, family run wineries in Italy, but La Lama may be the smallest I have visited. Located in the tiny hamlet of San Gusmè, just to the northeast of Siena, La Lama is a true “Mom and Pop” winery. It is operated today by Duccio and Tiziana Campani, the son and daughter-in-law of founder Giulio Campani. Their daughter, Sarah, helps out when not at her university, and the Campanis collaborate with the young oenologist Mirko Ferruccui. La Lama consists of only 2 hectares, from which it produces seven thousand bottles per year, all red. If you are wondering how we found this tiny winery, here is the story: We were dining one night this past spring at Enoteca Bengodi, a small but excellent restaurant in Castelnuovo Beradenga. The restaurant featured over 150 different Chiantis, and so I asked the waiter to recommend one since I was not familiar with most of these. I expected him to recommend one of the most expensive wines, but he recommended one of the least expensive. When we tried the La Lama Sottolaia and later the Riserva (courtesy of the waiter), I asked him to arrange a visit to La Lama the next day – which he did. Duccio & Sarah Campani. PHOTO: TERRI DUARTE. 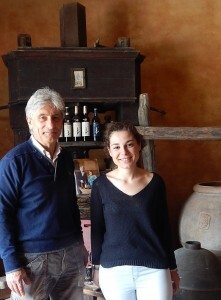 When we arrived at La Lama we were met by Signor Duccio Campani and his daughter Sarah. Since Sarah speaks English very well, she conducted the tasting in a quaint tasting room in the cellar. Our first red wine was a 2011 DOCG Chianti Classico Sottolaia, a 13% alcohol 100% Sangiovese grape offering. The Sottolaia was aged for three years in 10 Hl French oak casks and filtered before bottling. This wine was the typical garnet color of Chiantis with a pleasant fruit nose and a very smooth medium finish. I rated this wine a 90. Next we tried a 2012 IGT Caliptra, a blend of 70% Cabernet Franc and 30% Merlot. This 13.5% alcohol wine had a fresh but light fruit nose and a garnet color. It was aged three years in oak toasted barrels and one year in the bottle. La Lama’s “Super Tuscan” finished medium long and very smooth. I rated this elegant wine a 92/93. Our last wine was a 2011 DOCG Chianti Classico Riserva Terzo Movimento. This wine was a 14% alcohol, 100% Sangiovese offering with a garnet color and a slight leather nose. It was aged for three years in French oak casks and one year in the bottle. The result was a wine that finished medium long and very smooth. I rated this excellent example of a Chianti Classico Riserva a 93/94. 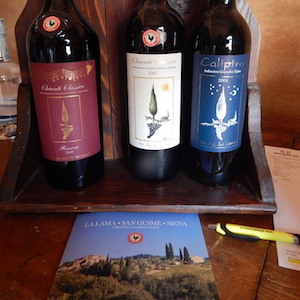 Unfortunately at this time La Lama’s wines are sold primarily in Tuscany, but should you see one while visiting there, I suggest you try it. You will not be disappointed. La Lama is a good example that small can be really excellent. Our thanks go to Sarah Campani for her hospitality during our brief visit.